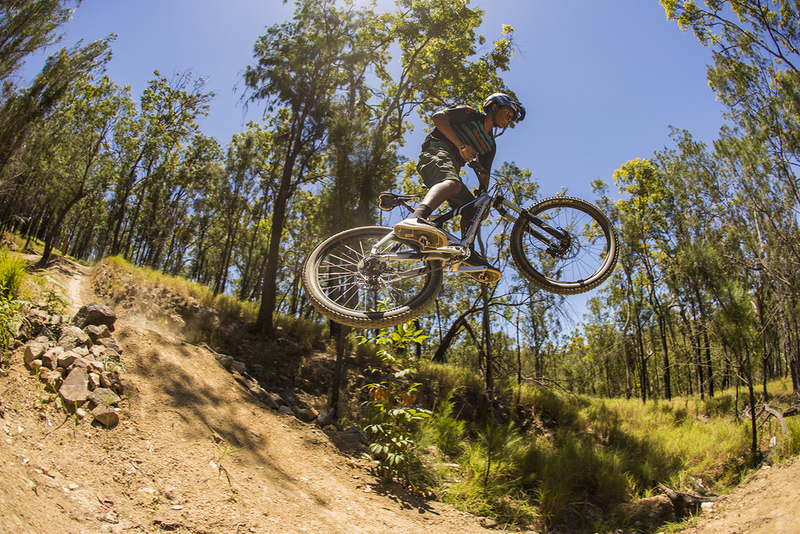 On our recent trip hosted by Tourism Tropical North Queensland, we travelled inland from Cairns to the Atherton Tablelands to check out the massive amount of work being done on the network of trails at the Atherton Forest Mountain Bike Park. VP of the Atherton Tablelands MTB Club, Leasie Felderhof fills in the motley bunch of journos and various locals on the trails we are about to ride, and where the next block will be gong in. With 30km of purpose-built singletrack already in use and a further 60km on the table over the next two years, this will be a must visit destination for mountain bikers heading north for the World Cup next year and beyond. Over $1million has been sourced for the construction through the Tablelands Regional Council, Queensland National Parks and Wildlife Service, State and Federal Governments, and in-kind donations from Tableland Cycle Sports, Tableland Futures Corporation, Tablelands Outdoor Recreation Association plus local and visiting riders. It's a real example of what a community can achieve with a bit of planning and hard graft. Jeff, our patient driver and bike minder for a couple of days, gets out of the van and into his element on one of the many fun and flowy trails. World Trail have been instrumental in the construction here, as in Cairns, and their trademark features are instantly recognisable; good use of natural features like this rock ledge, plenty of berms and alternate lines with jumps and drops that can be avoided if needed. The lay of the land is used to best advantage on the climbs, winding through the scrub to the tops of ridgelines with some sweeping views over the tablelands. The smell and feel of the bush, and the layout of the trails reminded me of my hometown trails in Newcastle, some 3000km away (and not quite as hot) where World Trail have also been building. The locals were out in force to show off their wares, and were pretty proud of what they have achieved so far and excited about what's still to come. There's a real sense of a mountain biking community in the township of Atherton, and someone commented that where a year ago they would see only a few riders out and know them well, now they hardly recognise anyone they see out there, but they soon become friends and a part of the crew,which is a good thing for the area. The car park had about a half dozen cars when we were there, not bad for a Thursday in the middle of nowhere! This is Renato, the Italian Stallion. He's in Atherton to hang out with the friends he met in Italy on a road tour, and is learning English during his stay. He'd never ridden a mountain bike before, but is now planning on bringing an Italian team over to race the Crocodile Trophy stage race, and to shred the singletrack he is now so familiar with. There are a few fireroads that can be used to shuttle, or if you're overly energetic and fit like these blokes you can ride to the top of the park for some singletrack goodness. I took the shuttle. Best. Decision. Ever. Ryan from World Trail railing a corner on one of his creations. The top of Ricochet trail is a winding berm-fest, with some of the highest walls on any berms I've ridden. It gets faster and more open towards the bottom, and we all wanted to get another run in before we had to leave. Jeff's son Belaihu, 15 years old and an amazing rider, sends it on one of the big doubles near the bottom of Ricochet. Belaihu shows Flow's Mick Ross the way down another tasty Atherton treat. The Bump Track is an iconic ride in the annals of Far North Queensland mountain biking... while it's not singletrack and is a point-to-point ride, it's still worth checking out when you're in the area. Fast as you dare go, lots of water bars to launch you if you dare, and pops you out just a short ride to the beaches of Port Douglas. This creek crossing breaks up the track as it dives down one side and climbs steeply out the other. Despite photo opportunistic appearances, it's unrideable and allegedly croc-free. The way not to do it. The Bump did claim one casualty, and how! Cycling Australia's MTB Technical Director and all-round good guy Tim Sheedy left more than just an impression on the track with a high-speed digger over the bars, snapping his carbon handlebar in the process. He still rode that sucker most of the way back to town though. A good man to have in charge right there. There's not many places where you can pick up some mangoes off the side of the road on the ride home. Luxury. Our digs at Port Douglas were probably too nice for a bunch of smelly, bleeding mountain bikers, but we were still greeted with cocktails and cold towels when we dragged ourselves in after a long, hot day of great riding. And there's plenty to be had up north, we look forward to checking out a lot more of it as the region develops, and of course the World Cup in April. If you want to plan a trip out to the Tablelands then BikeLinx can help with planning, accomodation etc. Check out ridecairns.com for more info. Thanks to Tourism Port Douglas, Atherton Tablelands Mountain Biking and Tourism Tropical North Queensland.